I ran the 13.1 miles in 1:46:28. That’s an 8:08/mi. pace. That time placed me 882nd out of 8,743 total finishers and 135th out of 792 in my age bracket. Not bad for a 40 year old. And just in case you think I’m lying to make myself look good (ha-ha) you can check out the official race results here by typing “Fourman” in the search field. I’m still trying to digest what happened Sunday morning. I’ve never run that fast, for that long in any of my trainings. To put it into perspective, that’s 14 minutes faster than I ran the same race last year. I find it amazing that an additional years worth of running could result in that great a change. The semi-scary part to me is that I know I can do better. I’ve only marginally begun to focus on proper diet and nutrition, something essential for runners. I could stand to lose 5-7 more pounds (which would equate to running 15-21 seconds faster per mile). I haven’t worked out my legs or my core by doing runner specific training exercises. I also need to work on my running form. If I can knock another 14 minutes off my time next year, I’ll be within just ten minutes of this year’s winning time for my age bracket. Hmmm…Do I smell a 2014 goal coming on? Here are a few more selective thoughts I’ve had since race day. When you are in the day-to-day grind, progress can be hard to see. One day you are up, the next day you’re down and it often feels like you are not generating momentum towards reaching your goals. I think that is because the time frames between evaluations are so short. We constantly analyze ourselves day-to-day, to the point where we might become to obsessive about it. Maybe it would be helpful to take a step back and gauge our progress over a longer period of time. It was tough at times to see how much better I was getting in the here and now. But now that I have markers 12-months apart the evidence is overwhelming. I’m a much better runner than I was a year ago at this time. Be realistic old man. I can’t compete with the 20-year olds whose names littered the top 30 finishing times. I shouldn’t expect myself to. I can only be who I am and develop goals that are appropriate for me. Planning leads to better results. I prepared differently this year in the two weeks leading up to the race. I ate better by including foods with more protein and carbs. I cut out sodas and ate a lot of fruit. I drank Gatorade almost exclusively from Wednesday on so as to hydrate my body properly. I took extra gel packs to consume during the race. I even memorized the course, mile by mile, and developed a plan of attack ahead of time. I knew when the terrain would change and I would be able to push myself on a downhill. I knew that coming out of Piedmont Park, I would be faced with about a mile and half upslope. 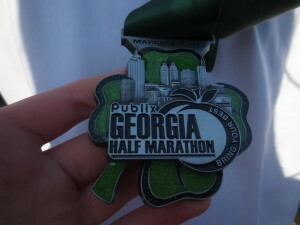 I believe the pre-race planning was a major factor in helping me accomplish my goal. I have one more thought about the race (and life) that I just can’t shake out of my mind. It will have to wait until Thursday though because it’s a post in itself and I’m already at 900+ words today. It may be a bit controversial too, so I want to give it adequate space. When was the last time you exceeded your expectations? How can we keep from getting so caught up in the day to day? That’s an excellent point! Many days you just have to keep putting your head down and going through the repetitive motions, even when you don’t feel like it. I had many cold mornings like that this winter when I really didn’t want to get out of my bed and go running. Congrats on achieving the goal. Running a half marathon is a big deal. I use to run Cross Country back in high school and it was tough enough doing just a 5k, I can only image what a half marathon would take. It’s a really fun race I’ve come to enjoy. It’s long enough to force you into disciplined training but not too long (like a marathon) that it consumes your life. I was able to train for this race running only three days a week. Those three training days took about 4 hours of my time. Congrats! Your first point about obsessing on the day-to-day is what gets a lot of investors in trouble. They see the market dropped X% today and forget to look that over the long term, they have done pretty well and should stick to their long term plans. Looking forward to the controversial post! I know Jon…I used to be an investor like that, especially when I was fooling around with the options market. I know that is a viable trading strategy, but it created too much stress in my life. Congratulations, that’s an amazing accomplishment and definitely took a huge amount of accountability, endurance, dedication, and passion. Pretty “cool” indeed. And aside from all of that what a good role model you are for your daughter teaching her that you have to make goals and fight to achieve them. Kudos! When I first started running, I did not anticipate the impact this would have on my kids. But recently, I’ve realized this whole process is teaching them a lot about achievement, goals, determination and perseverance. My oldest daughter, who just turned 12, is even hinting she wants to try a 5k this fall. It’s inspiring to see someone at [ahem] _our_ age reach and surpass a serious athletic goal. After years of practice (and practice in the manner you described: planned, organized, consistent, serious practice), I’m getting close to reaching some parallel goals in my golf game. Congratulations, again! Thanks AZ. You’re right, it takes a lot of practice and it’s important to see progress to stay motivated. I would love to get back to golf one day. I really enjoyed doing that. Thanks Shannon. I think your right about performing better with the group. All my training runs had been done by myself, so I think I got an extra boost by being around others. Plus, I find it fun to talk to other people during the race a bit and encourage them along the way. Wow, that’s awesome! That time is very good too boot! I love your approach to this was to plan for it and set yourself up for success as much as possible. That can be applied to almost anything that’s worthwhile in life. Thanks John! Nobody was more surprised than me. I’ve realized that if I want to accomplish something big, there is no way I can just wing it and succeed. Wow! Congratulations…and that time is excellent. I remember the last time I ran a 10k it was like an hour. I love that you set your mind to the goal and really prepared. That’s a metaphor for a lot of things in life..and it paid off! Nice job! Thanks! I think the little extra preparation I did this time really contributed to my success. I’m hoping that some more aggressive preparation will lead to even greater results next time.